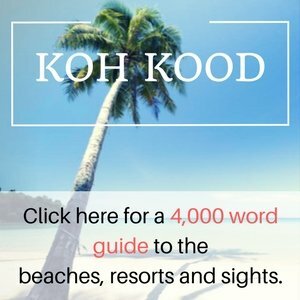 Which is the best beach on Koh Samet? Everyone will have their own anwser to this questions as there isn’t one beach that is the best on the island. Here is some information that might help you choose the best one for you. The best Koh Samet beaches are dotted from top to bottom along the island’s east coast with a couple to choose from on the west and north. Generally, things get more laid back the further south you go. Otherwise known as Diamond beach, Hat Sai Kaew is the biggest and most favourable by visitors to Koh Samed. Hat Sai Kaew’s meaning speaks volume of what to expect. Translating as “Crystal Sand Beach’ expect beautiful white sands in abundance. The beach is located on the North East island, not far from the main ferry pier, and is about a kilometre long. Just a 10 minute walk from the pier is the widest, whitest, busiest stretch of sand on the island. It’s proximity to the pier means it gets its fair share of package tourists but if you like to be where it all happens then the abundance of restaurants, bars and stalls here will suit you nicely. Be prepared for things to get noisy at night when the music pumps and the fire shows unfold on the squeaky white sand. Water sports such as water skiing, jet skiing, banana boats, and wind surfing are all available. The are various top quality restaurants that line the beaches and after dark the party scene come to life. Due to it’s popularity with weekend visitors from Bangkok, accommodation here can become scarce so be sure to book in advance. A further 5 minutes walk down the coast brings you to calmer Ao Hin Khok, a smaller and more laid back traveller and backpackers beach. You’ll know you’ve reached it when you pass the prince and mermaid statues at the end of Sai Kaew beach and at times it can feel a mile away from there although it’s only next door. This sandy haven is best appreciated from within a hammock, cold beer in hand. The Stunning Hin Kok beach is Koh Samed’s number 1 backpackers retreat. With most of it’s resorts being built back from the sand the 200m long beach is largely undisturbed. As well as it’s natural beauty it’s popularity amongst backpackers is also down to the affordable accommodation you will find in the area. Accommodation can fill up quite quickly here so it’s advised to book in advance. It’s clear blue waters offer some of the best swimming on the island. The atmosphere can get rather lively come sunset so those looking for the quiet life are best served on another part of the island. This bay is a half hour or so walk from the Na Dan pier and is a good base for investigating the few beaches to it’s north and south. Favoured by those seeking a more tranquil and quiet beach experience. The bay is hemmed in by the usual rocky outcrops on each side and the sand is Koh Samet’s trademark soft and aesthetically pleasing variety. What better place to spend your time as days blend into nights. Slightly off the beaten track, this is one of the more rocky Koh Samet beaches. It offers isolation but isn’t the best for swimming. That’s not a problem though as nearby bays can be used whenever the need to paddle arises. The headland between here and Ao Tub Tim can be climbed to get good views northwards towards Sai Kaew beach if you feel the need for exercise and a scenic outlook. It’s a 35 minute walk from the pier. Ao Cho is a small but picturesque bay with just a couple of bungalow operations and a wooden pier. At the time of writing it’s not possible to arrive here on boat from the mainland but that may change in the future so it’s worth re-checking. However, it is possible to get a boat straight to Ao Wong Duan and walk up from there. Otherwise, it’s a 40 minute walk from Na Dan on the north of the island. Within reach by direct boat from the mainland, Wong Duan’s gorgeous crescent-shaped cove is popular with package tourists as a result. It’s like a busy little sister to the larger Sai Kaew and is a good looking beach that caters more for mid-range and exclusive customers than those on a budget. There are mini-markets, shops and bars to keep you well stocked and amused during your stay on the beach. Expect a relaxed and enjoyable atmosphere amongst it’s crystal white sands and vivid blue seas. Accommodation is a little dearer here than other parts of the island but the quality warrants that bit extra. The usual water sports are available here. Expect people staying here to be sipping cocktails rather than buckets of Sam Song due to it’s more sophisticated approach. Samet’s southernmost island is where the wealthy come to stay. Expect prices and accommodation at the opposite end of the spectrum to Backpackers requirements. Although home to the islands most expensive resort the area still remains undisturbed and is regarded as the islands finest. The southern part of the beach offers the best swimming. The only beach located on the upper west coast of Koh Samet is sometimes referred to as paradise bay. If your looking for crystal clear blue sea and pristine white sands set in a quiet and relaxed atmosphere then this 200m long beach is definitely worth a visit. Expect expensive resorts and not backpacker accommodation if planning on staying at this exclusive resort. The amazing sunset that can be experienced from Ao Prao is worth the extra cost alone. If you love watching the sun set over the ocean then this beach offers good views of nature’s light show. If you’re staying here you’ll most likely get a transfer from Na Dan thrown in but if not you can walk here via the wooded track that heads across from Ao Hin Khok, taking about 20 minutes or so from that point. Around the next headland is Ao Phai, another stunning bay popular with the travelling backpacker crowd. It’s a 20 minute walk from the pier and there’s a mini-market here to help you keep nicely stocked up during your stay. It’s known to get a bit loud on the party front so it’s best to check out what’s going on if you’re a light sleeper. Apart from that the old ‘hammock and cold beer combo’ works like a treat here too. This very popular stretch of amazing white sand and vivid topaz blue waters offering some of the islands best swimming. Accommodation here is on the sharp incline with the many backpacker retreats that once lined these shores being replaced with more up market resorts. However being situated next to Ao Hin Khok means you can benefit from cheaper accommodation there and still appreciate Ao Pai. Otherwise known as Candlelight beach, Ao Thian has shorter intervals of sand broken up by stretches of rocks, this gives the beach the ideal balance between seclusion and accessibility. Make yourself feel like a lost and deserted castaway on one of Koh Samet’s most laid back beaches. The soft white sandy bay is hemmed in by large rocks on each headland and punctuated by some smaller ones along the beach. This adds to the setting and provides what feels like lots of mini beaches in one. It is well worth the short walk south from Wong Duan to experience the relative isolation. About half an hour’s walk south from the busy Wong Duan, Ao Wai is a dreamy little escapism bay that feels a world away from the noisier beaches it leaves in its wake. There’s just the one resort here so things don’t feel too cluttered on its relatively small white sandy expanses. All that’s left to do is kick back, soak up the views and let the warm sun soothe your troubles away.. utter bliss. If you’re looking for a stunning beach with jet-set luxury bungalows then you should head down to Ao Kiu. There are twin bays here, one on the east coast (Nok) and a rockier one on the west (Nai). You’ll need to lodge at Samet’s most exclusive resort if you want to stay here, at a price to match. It’s a long walk down the island but you’ll most likely be arriving by boat or taxi transfer. . . so no worries there! Staying on this beach provides nice views across the sea towards the mainland hills. A narrow road hugs the coastal contours and it is dotted with several resorts to hole up in. Note that you’ll need to be at the far western side of this stretch to have the sandy beach at your toe-tips, so bear this in mind when booking to make sure you’re actually on the beach. A 25 minute walk from Na Dan pier will get you here. So there you have it, a more than ample supply of Koh Samet beaches to whet your appetite! The hard part is choosing which one to stay on but hopefully our guide has helped you narrow things down a little.